For both of my scrolls I commissioned the only known craftswoman in Israel (and perhaps the world) who makes this sinew. In turn, I am the only woman to whom she has sold this sinew for the purpose of binding a Torah scroll. 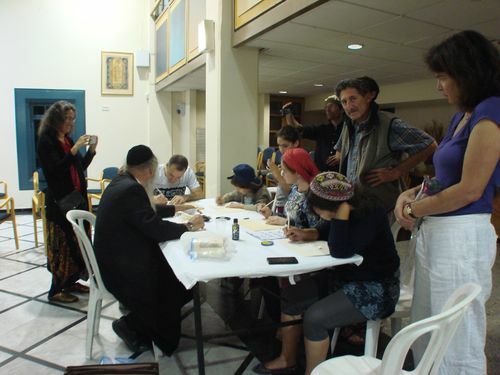 For the City Shul Torah I wanted to widen the circle of people involved in creating this scroll and, in particular, offer an opportunity to engage in a sacred act that most would never have an opportunity to do over the course of their lifetimes. I sent an open invitation to anyone who was interested to come to Jerusalem and to bind this scroll in community. What was not finished would be bound with the City Shul community in Toronto. A Torah scroll is usually written on 62 parchment panels that must be bound in accordance with Jewish law with the sinew of a kosher animal. The Yemenite community has a tradition in which the women of the community gather to bind the scroll that a male scribe has completed. 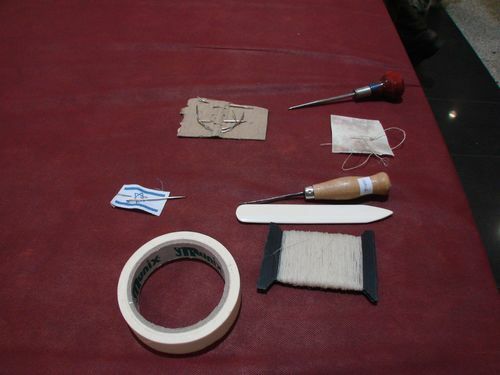 Binding a scroll, however, is usually done single-handedly by the scribe. In many Jewish communities around the world, women only ever see the scroll opened at a distance. 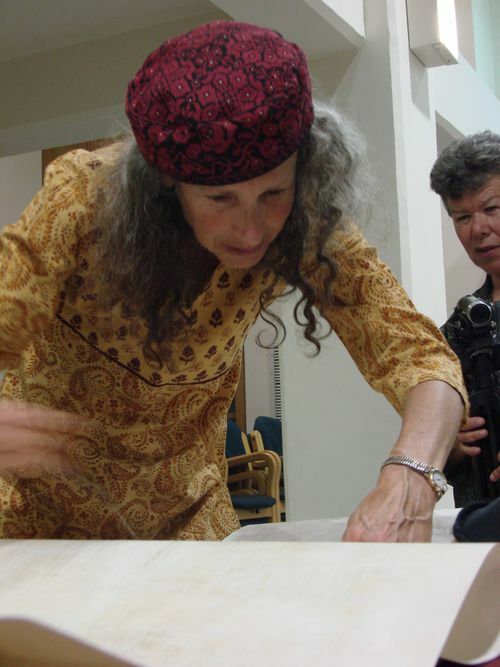 In some communities, women carry the Torah or kiss it when it comes out of the ark, and in other communities women read the weekly portion from the scroll. But most women, and men, never have an opportunity to help create a Torah scroll. It is an awesome task reserved for the handiwork of the scribe. We meet at a local, progressive Beit Knesset (lit. House of Gathering i.e. synagogue) that sits at the convergence of four neighborhoods in Jerusalem. I have chosen this synagogue because of its location, it’s beauty, its politics and most significantly, because this is the community where I, 20 years earlier first encountered the sacred beauty of the Torah and returned to my ancient roots. We are 50 people - men, women and some children - from all walks of religious observance and practice. Some come just to watch or listen - uncomfortable with the act, but intrigued by the offering. Most come to sew. Julie, Hanna and I are the three scribes on the project from Israel. We sit on a panel that Rabbi Ruth Kagan, a native Israeli, female Rabbi facilitates, herself an oddity in a world occupied predominantly by male rabbinic leadership. We speak to the different aspects of writing a Torah from the practical to the spiritual. Our teacher is present. He supports every, and all of our efforts and still will not read from our scrolls. His offering for the evening, beyond his pride for his students, is a round table where he teaches basic letter-forming skills. After our panel we break to begin the sewing. It is an awesome task before us and we have many hours of work ahead of us. The enormous space of the sanctuary is silenced as we pull out our completed panels and lay them on the table. The air in the room is of fascination and awe. The hands are mostly those of women. We will complete only half of our task tonight over the next few hours. We demonstrate, facilitate others as they recite the necessary blessing and sew. We listen to the stories they tell, guide their hands, allay their fears, hold their awe and gratitude. A filmmaker comes to speak with those who partake and those who don’t. We sew as much as we can and what is not complete will be completed with the Toronto community the next week. By this measure we are in essence “binding” the Jerusalem community with the community of Toronto and it has great resonance for all who have contact with this new scroll.